BurgerFuel is a New Zealand-based restaurant chain that advocates for the arts. They have their own resident artist, team of graphic designers, and even run a few of their own arts based programs. To celebrate the opening of their first U.S. location, in Broad Ripple Village, BurgerFuel not only created custom murals for the interior of their store but also created them throughout the Broad Ripple community. The owners of Broad Ripple’s Alley Cat bar gave Haser full rein of their exterior wall. Rising to the occasion, he tied the piece back to the building and business with his own creative take on what an alley cat looks like. Haser is BurgerFuel’s resident artist and head of their “Creative, Sweet” arts program. He works as part of BurgerFuel’s graphic design team at their headquarters and travels the world to create pieces specifically for BurgerFuel, as well as creating pieces of his own with his crew, TMD. BurgerFuel is a New Zealand-based restaurant chain that advocates for the arts. They have their own resident artist, team of graphic designers, and even run a few of their own arts based programs. To celebrate the opening of their first U.S. location, in Broad Ripple Village, BurgerFuel not only created custom murals for the interior of their store but also created them throughout the Broad Ripple community. The morning that Haser arrived at the Bright Ideas building to paint, inspiration struck. When Haser saw a Cardinal he decided to give it a BurgerFuel makeover. The Cardinal being the state bird, this seemed a fitting hybrid. Haser is BurgerFuel’s resident artist and head of their “Creative, Sweet” arts program. He works as part of BurgerFuel’s graphic design team at their headquarters and travels the world to create pieces specifically for BurgerFuel, as well as creating pieces of his own with his crew, TMD. BurgerFuel is a New Zealand-based restaurant chain that advocates for the arts. They have their own resident artist, team of graphic designers, and even run a few of their own arts based programs. To celebrate the opening of their first U.S. location, in Broad Ripple Village, BurgerFuel not only created custom murals for the interior of their store but also created them throughout the Broad Ripple community. 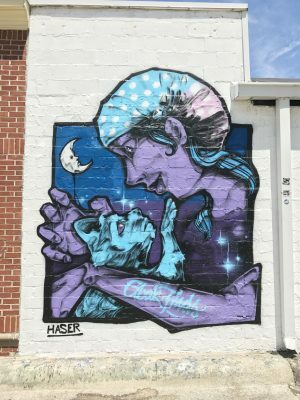 A graffiti artist’s version of a love letter, this piece stands as Haser’s celebration of the Broad Ripple community. Since its creation, it has become a popular local landmark for social media snaps. Haser is BurgerFuel’s resident artist and head of their “Creative, Sweet” arts program. He works as part of BurgerFuel’s graphic design team at their headquarters and travels the world to create pieces specifically for BurgerFuel, as well as creating pieces of his own with his crew, TMD. BurgerFuel is a New Zealand-based restaurant chain that advocates for the arts. They have their own resident artist, team of graphic designers, and even run a few of their own arts based programs. To celebrate the opening of their first U.S. location, in Broad Ripple Village, BurgerFuel not only created custom murals for the interior of their store but also created them throughout the Broad Ripple community. This piece was painted live at their opening party on May 29th, 2017. This graffiti piece was inspired by the Indy 500 and includes the artist’s self-portrait. Haser is BurgerFuel’s resident artist and head of their “Creative, Sweet” arts program. He works as part of BurgerFuel’s graphic design team at their headquarters and travels the world to create pieces specifically for BurgerFuel, as well as creating pieces of his own with his crew, TMD. This mural was completed by the Department of Public Words in the summer of 2016, with the help of youth from the TeenWorks program and community volunteers. The design was by Megan Jefferson, Dave Combs, and Holly Combs. It is located on the Tradesman Guild Building on the Monon Trail at 1140 E. 46th St. 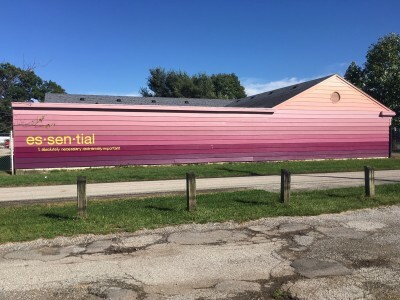 The project was made possible by the Central Indiana Community Foundation, the Penrod Society, Meridian-Kessler Neighborhood Association, and the Efroymson Family Fund. Inspiration for this work came from the artist taking a boat tour in the high sawgrass of the Florida Everglades. The emotion behind the work is reduced to an elegant play between lines and arcs. The work is organized based on the harmony and tension of opposing planes, combining symmetry and asymmetry as a means to communicate clearly and with strength. The use of unyielding material and the austere industrial processes necessary to transform the metal, is intrinsic to the magnitude of the power behind the form. The vivid color helps to distinguish the sculpture from its background, and serves to support the mood of the piece. Bernie Carreño is an Indianapolis-based, nationally renowned metal sculptor whose work can be found in museum, corporate, and private collections across the United States and Canada. 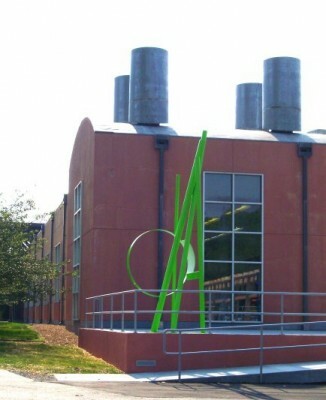 He is well known for his massive, colorful, large-scale public art. His trademark style is considered minimalist abstract with a definite constructivist influence. He has exhibited extensively in indoor gallery and outdoor public art venues. Charles R. (“C. R.”) Schiefer is a stone sculptor based in Martinsville, Indiana. His work is influenced by his admiration for pre-Columbian and African-Oceanic sculpture and artifacts. Like the “primitive” artist, his sculptures have minimal detail, clean lines, and positive, optimistic rounded forms. When possible, they also include movement, action, and humor. In Faces of Indiana for the Millennium 2000, Schiefer uses his style to convey the many types of people found in and around Indiana. 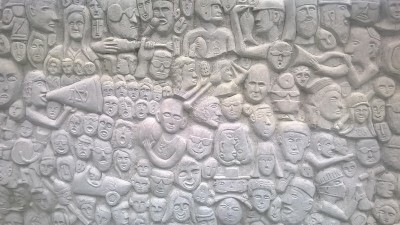 Included in this sculptural piece is a Pacer basketball player, an Indy 500 race car driver, a Notre Dame cheerleader, and a number of other Indiana-centric faces. 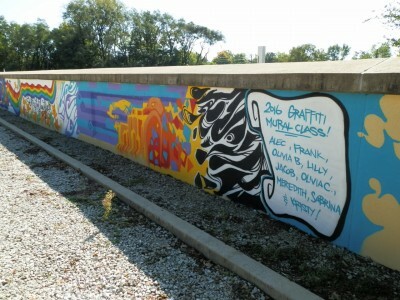 This mural along the north-facing wall of the 67th Street floodwall was created by the students of a week-long Graffiti Mural Camp program at the Indianapolis Art Center in the summer of 2016. The Camp was presented in partnership with the Indy Urban Artist Network. The theme of the mural is love, peace and understanding, and the design includes examples of several “street art” styles and painting techniques. Each section was created by a different student, and teaching artists Matt Lawrence and James Quebbeman contributed to the mural to bring unity to the piece and paint the lettering. Participating students were Olivia Bauwens, Olivia Childress, Meredith DiCamilla, Jacob Keith, Frank Riegner, Sabrina Searcy, Alec Surridge, and Lillian Watness. The Urban Artist Network was founded in 1999 to address the unique needs of emerging urban artists and arts organizations. Its vision and purpose is to close the gap between urban artists and their communities by offering the tools for artists and communities to reach their goals together. UAN offers various public presentations on the topic of using aerosol art as a commitment to community beautification, and provides insight into the culture of graffiti art. 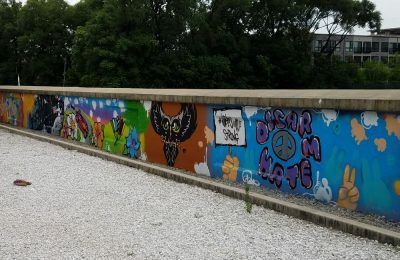 This mural along the north-facing wall of the 67th Street floodwall was created by the students of a week-long Graffiti Mural Camp program at the Indianapolis Art Center in the summer of 2017. The Camp was presented in partnership with the Indy Urban Artist Network. The theme of the mural is love, peace and understanding, and the design includes examples of several “street art” styles and painting techniques. 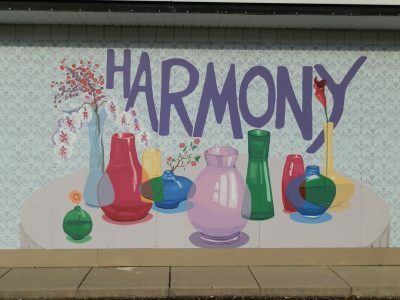 Each section was created by a different student, and teaching artists Matt Lawrence and James Quebbeman contributed to the mural to bring unity to the piece and paint the lettering. The Urban Artist Network was founded in 1999 to address the unique needs of emerging urban artists and arts organizations. Its vision and purpose is to close the gap between urban artists and their communities by offering the tools for artists and communities to reach their goals together. UAN offers various public presentations on the topic of using aerosol art as a commitment to community beautification, and provides insight into the culture of graffiti art. 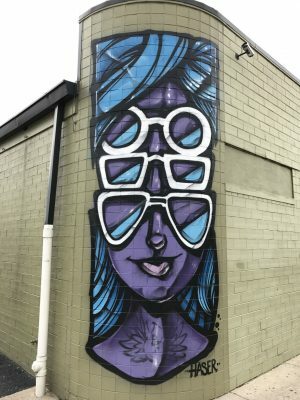 This mural was painted by the Indianapolis Art Center’s Graffiti Mural Camp, and executed June 11-15, 2018. The camp was led by professional mural artists Matt Lawrence and James Quebbeman. The twelve students, ages 14-16, worked collaboratively on the mural. It includes lighthearted imagery and encouraging messages, as well as a message of peace and solidarity in response to the Noblesville school shooting in late May 2018. Students involved include: Halle Cole, Mary Cowdin, Kaya Edwards, Justin Gershman, Helen Hauser, Ana Kurek, Samantha Landreth, Cooper Rigney, Eve Swanson, Julia Sweet, Lillian Watness, and Kenley Williams. Matt Lawrence is a member of Bridge Collective, a group of graffiti writers, musicians, muralists, poets, and street artists who work together and separately on projects of interest. James Quebbeman is a member of the Urban Artist Network, whose mission is to make the arts accessible to people of all economic and educational backgrounds while promoting emerging urban artists. 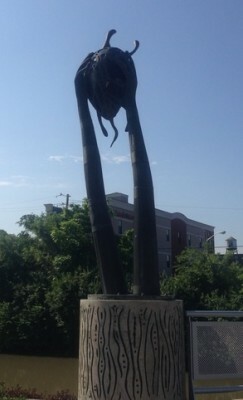 Located in Broad Ripple Village. Heartland is located on the side of the Egyptian Cafe hookah bar, facing the Broad Ripple Post Office. Completed using a combination of aerosol and hand-brushed paint application methods, this mural was a collaboration between artists Rafael Caro, Lauren Neely, and Erica Parker. Heartland was created with Indiana’s natural beauty in mind–from our farmlands to our forests–and includes our luscious state flower, the peony. 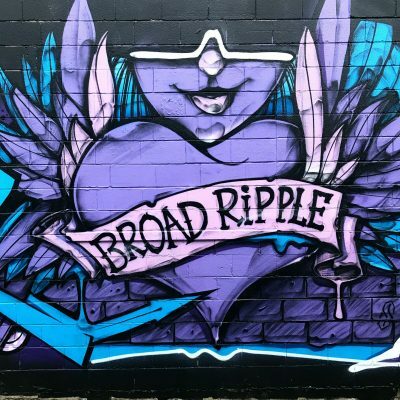 The Broad Ripple Impeach with Speech Mural has been a fixture in the community since one of the first annual Subsurface Graffiti Expos in 2004. 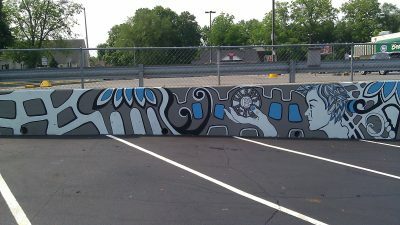 This creation can be found in the alleyway behind Kroger on Guilford Avenue, where many other graffiti pieces from the 2004 Subsurface event have since been covered. Subsurface is an event that showcases mural and graffiti artists from all over America and beyond. Since 2002, artists have traveled to Indianapolis every Labor Day weekend to create work and build community. Subsurface seeks to advance the art form through beautifying and revitalizing the landscape of urban neighborhoods. Subsurface also seeks to raise social and cultural awareness and promote the arts as an institution of empowerment for all involved. Implication of Three is a 20-foot soaring three-sided column gaining volume as it ascends toward the top. It is made of inner steel and poured concrete core to which more than 650 tiles, created by the artist himself, were adhered within the designs and incisions in the concrete. These textured, cream ceramic tiles are glazed in patterns and shades from deep blue to emerald green that stand out in all seasons. 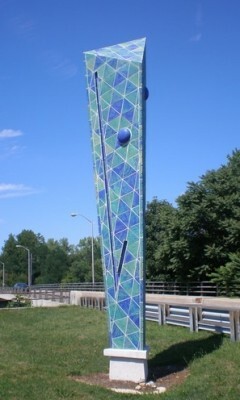 The piece invites study and reflection and greets visitors on the main Broad Ripple Village north-south artery. 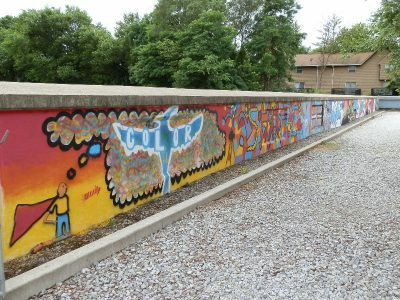 The imagery of this mural reflects the vibrant atmosphere of Broad Ripple Village, particularly its youth culture. It was painted in 2012 to help prevent tagging of the wall by providing something fun and interesting to look at. The Kilroy’s logo appears along with the “Kilroy” character, a bald man seen as if peeking over the logo. The limited color palette gives it an intriguing graphic look. The character of “Kilroy” dates back to World War II, where it was a common graffiti image drawn by American GI’s in Europe. It originated simply with the phrase “Kilroy Was Here,” possibly derived from a military legend, and used as a joking way of indicating that the GI’s had passed through. The accompanying image became linked to the phrase after contact with British soldiers, and was likely derived from their own ubiquitous graffiti character they called “Mr. 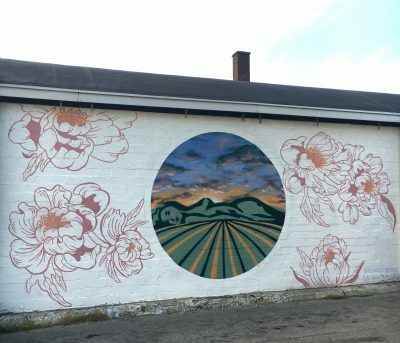 Chad.” The artist, Barbara Stahl, has been painting murals in Indianapolis since the early 1990s, in addition to creating fine art as a studio artist. 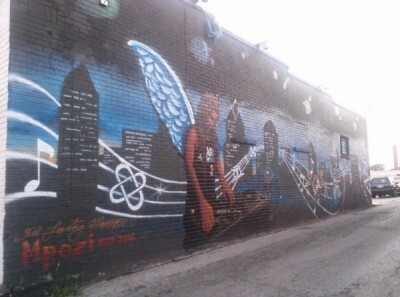 This mural honors Mpozi Mshale Tolbert, a highly visible Indianapolis photojournalist, DJ and creative entrepreneur who, in 2006, suddenly collapsed and died at age 34. Tolbert was born in Philadelphia and sold his first photograph to the Philadelphia Daily News at age 16. As a young man, he freelanced in Philadelphia, covering everything from breaking news to Philly’s vibrant music scene. He even documented the rise of hip-hop super group The Roots, and lent both his keen eye and voice to their record Do You Want More? After shooting for the Associated Press and Vibe, among others, Mpozi landed a staff job with the Indianapolis Star at 26. Despite his 6’6” frame, subjects said that Mpozi simply disappeared behind the camera. Whether he was covering the wreckage of 9/11, or a quiet moment between a son and his father just back from Iraq, his photos deftly captured life’s pleasure and pain without exploiting it. In addition to his career as a photojournalist, Tolbert maintained a studio in Fountain Square where he displayed his photographs of Philadelphia and New York. He also was a Sunday night DJ at a Broad Ripple nightclub where he played reggae and Brazilian music. The mural includes a portrait of Tolbert with angel wings, and its imagery alludes to his professional endeavors. BRIDGE (Beyond Redefining Individual Dreams & Gaining Exposure) is a group of Indianapolis artists who have been working since 2002 on collaborative, socially-aware projects. Members include visual artists, musicians, literary artists and DJs. The Mpozi Mural was spearheaded by members Matt Lawrence and FAB Crew. 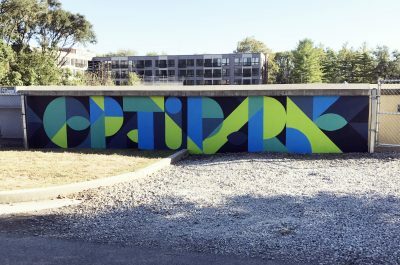 This mural was commissioned by the Optimist Club of Northside Indianapolis as a wayfinding element for Opti-Park, a small park that they own and maintain for the benefit of the neighborhood. The Optimists wanted a design that could function both decoratively and, for those who are looking closely, as signage. The artist, William Denton Ray, used circles, leaf shapes, and 90 & 45 degree angles to keep it an optical abstraction. He chose a simple 6-color palette of blues, greens and teals to harmonize with the heavily forested land and the nearby White River. BurgerFuel is a New Zealand-based restaurant chain that advocates for the arts. They have their own resident artist, team of graphic designers, and even run a few of their own arts based programs. To celebrate the opening of their first U.S. location, in Broad Ripple Village, BurgerFuel not only created custom murals for the interior of their store but also created them throughout the Broad Ripple community. 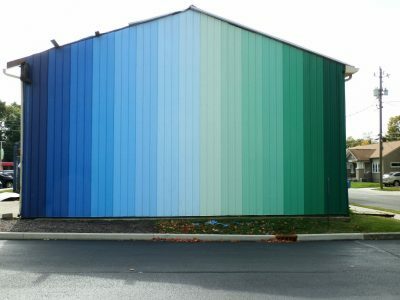 Haser’s final stop while in Broad Ripple Village was the Ossip Optometry building where he was once again given creative freedom. He again, responded to the space and tied the piece back to the space. Haser is BurgerFuel’s resident artist and head of their “Creative, Sweet” arts program. He works as part of BurgerFuel’s graphic design team at their headquarters and travels the world to create pieces specifically for BurgerFuel, as well as creating pieces of his own with his crew, TMD. BurgerFuel is a New Zealand-based restaurant chain that advocates for the arts. They have their own resident artist, team of graphic designers, and even run a few of their own arts based programs. To celebrate the opening of their first U.S. location, in Broad Ripple Village, BurgerFuel not only created custom murals for the interior of their store but also created them throughout the Broad Ripple community. 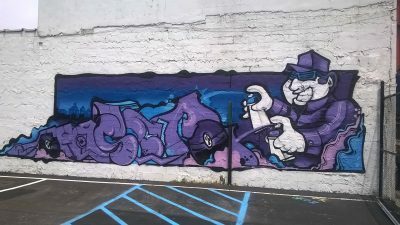 During his time here, Haser got to know the Broad Ripple arts community a little better through this join-up piece with local Indy artists including Sacred and 6Cents from the FAB crew. Haser is BurgerFuel’s resident artist and head of their “Creative, Sweet” arts program. He works as part of BurgerFuel’s graphic design team at their headquarters and travels the world to create pieces specifically for BurgerFuel, as well as creating pieces of his own with his crew, TMD. 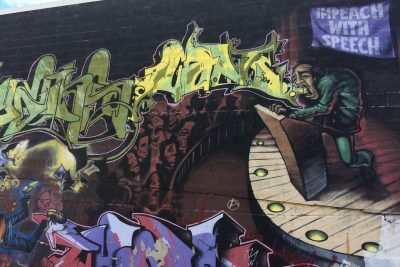 Celebrating Broad Ripple’s rich musical past and present, Rheinhardt’s mural depicts a modern day pied piper sweeping up the masses into his musical wake. The mural represents the spirit of Broad Ripple and the importance of the arts to community life in this vibrant cultural district. 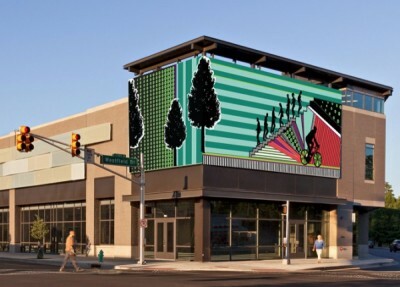 The mural was one of 46 murals commissioned by the Arts Council of Indianapolis as part of its nationally renowned 46 for XLVI mural initiative. The artist’s vision for The Gateway was to visually unlock the energy, activity and life of Broad Ripple. She intended to create a design that complements the unique identity of the neighborhood, with its diverse street life, shops, restaurants, night life, and downtime with one’s family. Michelle Carollo is a Brooklyn, NY-based artist whose strong graphic style is ideal for large scales. “I’m not so interested in making these grand political statements,” she says. “I’m more interested in creating a sense of beauty…capturing energy, the excitement, the idea of fun, of contemporary movement and culture.” The artwork was facilitated by the Indianapolis Art Center. In the heart of Broad Ripple Village, behind the Red Room building, artist Rafael Caro has created an imaginative piece inspired by the sea and the human spirit. 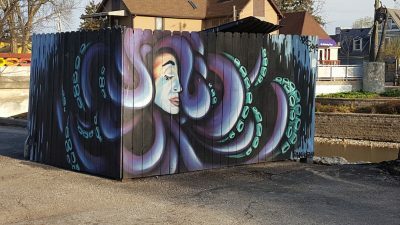 This mural comes from the artist’s original concept of the “octo lady.” After numerous pencil and ink drawings of this concept, the woman transformed into what you see on the fence today. She lurks in the deep but always finds light wherever she goes, highlighted by the blue glow on her face and tentacles. Caro believes that The Octo Lady represents a deeper meaning: “no matter how deep you are in or how different you may look, life is beautiful and so are you.” Rafael Caro is a local graphic designer, mural artist, and concept developer. 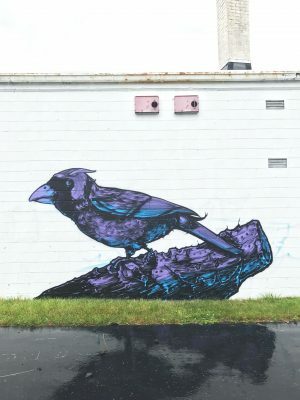 Caro has been a mural artist since 2011 and received an associate’s degree in design and visual communications from Ivy Tech Community College in 2015. This mural was designed by Indianapolis artist Megan Jefferson and completed by Megan and Corey Jefferson and Holly and Dave Combs as a Department of Public Words project. It was commissioned by TCC Software Solutions. The artist thinks of this mural as a visual representation of a breath. It is inspired by both the green grass below the mural and the blue sky above. There is a bit of a “secret” message on each end of the mural. In binary code, one side says “technology” – representing TCC and their focus on software solutions, and the other end says “community” – representing the focus of DPWords’ work. 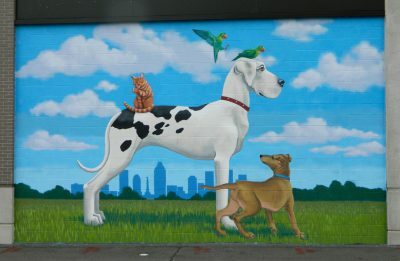 For the Broad Ripple Animal Clinic, Indianapolis artist Amy Rheinhardt painted a series of whimsical animals in a folk-art style that highlights their “humanity.” Set against a backdrop of clouds and the city’s distinctive skyline, the mural proclaims the importance of domestic animals in everyday life. ZERO is a wind-powered, kinetic sculpture that mesmerizes viewers with its constant motion and repetitive patterns. The sculpture is made from shapes that catch the slightest breeze and pass the energy from the wind to each spinning arm in a precise order. The title comes from the circular shape of each element and the overall circular form. The artist, Anthony Howe, is a native of Utah and at the time of ZERO’s installation, maintained a studio on Orcas Island, Washington. Initially experimenting with sheet metal, he became a full-time artist in 1994 to create the works for which he is best known.